This tutorial will cover MuseScore 2 – the most accessible free and open source editor currently available – and Sibelius 7 and Finale 2014, the two most popular commercial notation editors. If you have access to more than one editor, learning to use them all is worthwhile. You will reinforce the common ground they hold, and gain deeper awareness of their quirks – and they all have quirks. Even if you are using a different tool, try out the keyboard shortcuts that follow anyway. You will find that many of them still work. Checking the MuseScore “Notes” menu to make sure that “Note Input” is enabled. Checking the Sibelius “Note Input” tab to make sure that “Input Notes” is enabled. In Finale, a newly created score will include a caret at the beginning. If it isn’t, make sure you are in Simple Entry mode (quaver button on the toolbar). What can I do now I have a caret? Type letters from a to g to enter new notes by pitch. Try typing a scale. Each note will be created with whatever note duration you started with – to change this, see below. Once you start entering melodies, you will probably find that some notes appear an octave out of place. Because you are typing letters, your application has to guess at the octave. Usually it chooses the nearest note to the previous one entered. So, if you wanted a fifth above, you will actually get a fourth below. 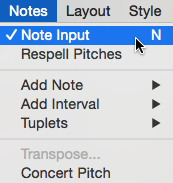 In MuseScore, the previously entered note remains selected. Press the up or down arrow key to move this by a semitone, or hold down control (Windows and Linux) or command (Mac OS) while pressing an arrow to transpose by a whole octave. 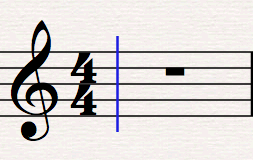 In Sibelius, the previously entered note also remains selected. Use the same arrow key combinations as for MuseScore, although single arrows move by a degree within the current scale instead of a semitone. In Finale, new notes actually appear relative to the coloured note shown within the caret. Usually this is the pitch of the previously typed note, but you can move it before typing a new pitch. 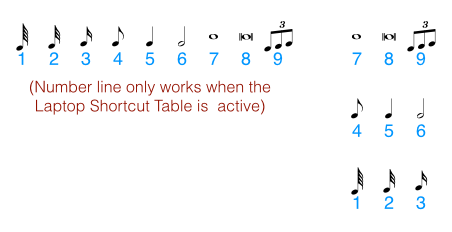 Press the up or down arrow keys to move the caret note by one degree within the scale, or hold down shift (Windows) or command (Mac OS) while pressing an arrow to move by a whole octave. The note in the caret will only be added to your score one you press a pitch key, or you can press enter to add that exact note – useful for repeated notes. 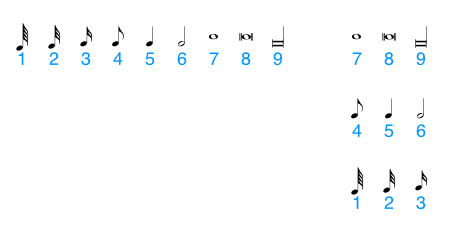 Almost all applications use the numbered keys to select note duration, but the exact mapping of numbers to letters is erratic. Worse, the number line (the row above the letter keys) often behaves differently from the numeric keyboard (the 3×3 block like a telephone keyboard). This would be fine if we all had numeric keyboards, but most laptop computers and some desktop keyboards don’t. If you have a numeric keypad and it isn’t working, try pressing Num Lock. MuseScore uses both sets of numbers interchangeably. Pressing 4 selects a quaver, 5 a crotchet, 6 a minim. Shorter and longer durations follow the pattern, down to 1 for a hemidemisemiquaver and 9 for a longa. The note selection toolbar will highlight the active note. Select “Keyboard Shortcuts” on the left. Change the “Current feature set” to “Notebook (laptop) shortcuts”. If the keypad panel shown below isn’t visible, go to the”View” tab, find “Panels” and make sure that “Keypad” is checked. It may be hiding at a corner of the screen; try switching it off and on again to see if you can spot it. If you aren’t seeing notes on the keypad, it may be in one of its other tabs – there are six of them, with all the most popular editing functions buried there somewhere. Click on the semibreve symbol at the top of the keypad to return it to its “Common notes” tab. Finale by default only recognises the numeric keypad, but a single configuration change also enables the number line. Make sure Simple Entry Mode is enabled. Click on the “Edit Keyboard Shortcuts…” button. 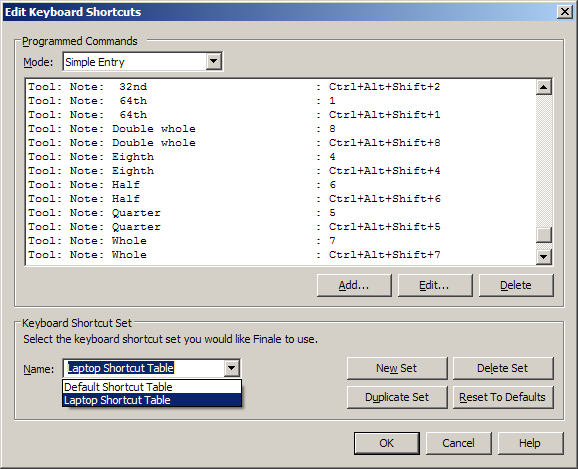 Under “Keyboard Shortcut Set”, select the “Laptop Shortcut Table”. With that selected, Finale’s keys are much like MuseScore’s. (More precisely, since Finale came first, Finale was probably the inspiration for MuseScore.) The only difference is that 9, instead of being the rarely-used longa, turns the previously entered note into a triplet. In all three applications, the . key increases a note’s duration by half. In MuseScore and Sibelius, this applies to the next note entered. In Finale, the dot is added to the previously entered note. This may only work on the numeric keypad unless you have laptop keyboard shortcuts enabled. In all three applications, the zero (0) key creates a rest of the currently selected duration. MuseScore, as previously discussed, allows semitone adjustments through the up and down arrow keys. Enter your note in the current scale, then move to suit. Sibelius has accidentals on the keypad. If the caret is visible, these will affect the next note entered. If a note is selected, they will apply to it instead. Finale uses n for natural, = and – on the number line for a single sharp or flat, and + and – on the numeric keypad for multiple semitone changes. All of these apply to the previously entered note, despite Finale otherwise allowing edits to the caret that only apply when the next note is entered. By this time, you may be wondering why Sibelius and Finale prefer not to use the number line for note durations. They keep this free so you can enter chords: type a number to add that interval on top of the previously selected note. If your most recent note is out of place, you will probably find you can backspace over it. (In MuseScore, this will sometimes under previous note movements; keep pressing backspace and eventually the note will be deleted. You also have undo and redo in the “Edit” menu; take note of the keyboard shortcuts for these. They will be some combination of control, shift, command, y and z. Practice undoing and correcting errors without switching from keyboard to mouse; you can work much more efficiently that way. If you have a Num Lock key, make sure it’s on. In MuseScore and Sibelius, try pressing n for note entry. 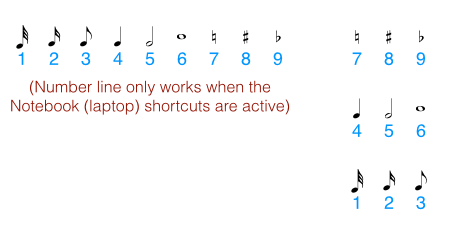 In Sibelius, also press – to reset the keypad to “Common notes”. In Finale, make sure the Simple Entry Tool is active. Add the next note with the mouse, then continue with the keyboard from there. Might I still need the mouse? Some less common functions are only available through the mouse. Just learn the keyboard shortcuts for the most common tasks you need to do. It is also possible to use them in tandem – keyboard to select durations and mouse over the score to place notes, or mouse over the toolbar to select duration and keyboard to choose pitch. The trap you want to avoid is using the mouse alone. This means repeatedly moving the mouse over the toolbars to select duration, then to the score to place a note, then back to the durations, then back to the score. Not only is this slow, the motions involve put you at great risk of repetitive strain injury. Could I play the music instead? If you have a keyboard – or other instrument – that supports MIDI (Musical Instrument Digital Interface), you can play directly into your computer. Configuring both the instrument and the software is beyond the scope of this document. Someday we may be able to play any instrument into a microphone and have the computer notate it accurately, but that day is not today. Owners of Sibelius may verify this by trying out AudioScore Lite. As with everything else in music, practice, practice, practice. Efficient notation is a skill you can cultivate, and will pay off endlessly once learnt – not only in speed of copying, but in freedom to compose without being distracted by your tools.